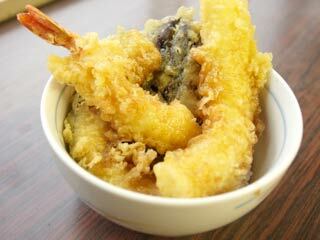 Tendon is a rice bowl with Special Sauced Tenpura. It is one of the best way to enjoy eating Tenpura. Add 6 large table spoons of Mirin and boil it until all Sake vaporize (takes 1 or 2 min.). Add 2 large table spoons of Soy Sauce. Add 1 small table spoon of Dashinomoto. Add 2 large table spoons of Sugar. Then boil it until all sugar dissolve and thickened. Prepare a bowl with rice and pour the sauce over the rice. Put Tenpura over the rice and pour the sauce again.